Fairfax Green Renée Goddard was appointed to fill a vacancy on the Fairfax Town Council on April 3rd. An 18-year resident, teacher, environmental consultant and activist, and mother of two, who stands for "visionary thinking from a realistic perspective", Goddard replaces outgoing Green Ryan O'Neil, who moved just outside of the city limits in February and thus vacated his seat. Goddard becomes the fourth Green once again on the five-member Town Council, where Greens have had at least a 3/5 majority since 2009, joining Mayor John Reed and councilmembers Larry Bragman and Pam Hartwell-Herrero. Goddard joined the Green Party on Earth Day 2012, when she registered Green at Earth Day Marin. "I was and am disillusioned by what our government defines as leadership. All ethics lost to the point where, as a parent, I feel like I have to shield my children from the bitter battles modeled by our politicians, who bow to the financial manipulations of big corporations." "I wanted to feel proud of the leadership I take my time to vote for. If government is a disgrace which makes you feel ashamed before your children, then its time for a change. The Green Party stands for what I stand for, and is willing to look at the larger collage of people's needs and human rights and drive the necessary steps to accomplish the job." In seeking appointment to the Fairfax Town Council, Goddard emphasized "transit oriented development that matches our town's unique character and meets the great variety of people's needs", along with the city being a model of participatory democracy, and expanded opportunities for youth, music and art. Renee has been the Zero Waste project coordinator for Sustainable Fairfax, and intends to continue driving Fairfax toward its goal of Zero Waste by 2020, 5 years ahead of Marin County’s goal of 2025. Combining the experience of her work as a whitewater guide and team building coordinator for Project Raft (Russians and Americans for Teamwork) with her Masters degree in Drama Therapy and being a long-time boardmember at Sustainable Fairfax, Goddard has learned to listen, organize and activate people around common passions and goals. She hopes to bring those skills to the Council. Goddard was the project coordinator in August 2012 of the first ever Streets for People event in Fairfax, which closed Bolinas Road in the town center for two blocks between noon and 4pm on a Sunday afternoon. Advertised as a celebration of local businesses, residents, art and non-motorized transportation, closing the road also served as an experiment to see if the town could realistically move toward the general plan vision of making that stretch of road a permanent vehicle-free greenway. The result was that drivers took alternative routes (and/or drove less) and traffic moved freely, while 1,000 people packed Bolinas Road. Streets for People is loosely modeled after San Francisco's Sunday Streets, whose coordinator, is avid cyclist and long time San Francisco Green Susan King. 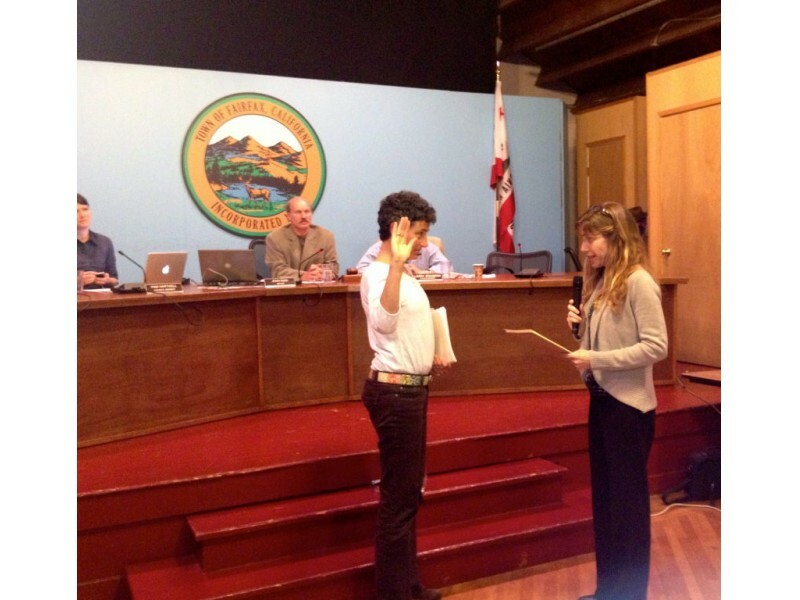 Photos Credits from Fairfax Town Council meeting to Garrett Toy, as originally published on the San Anselmo-Fairfax Patch, April 4.